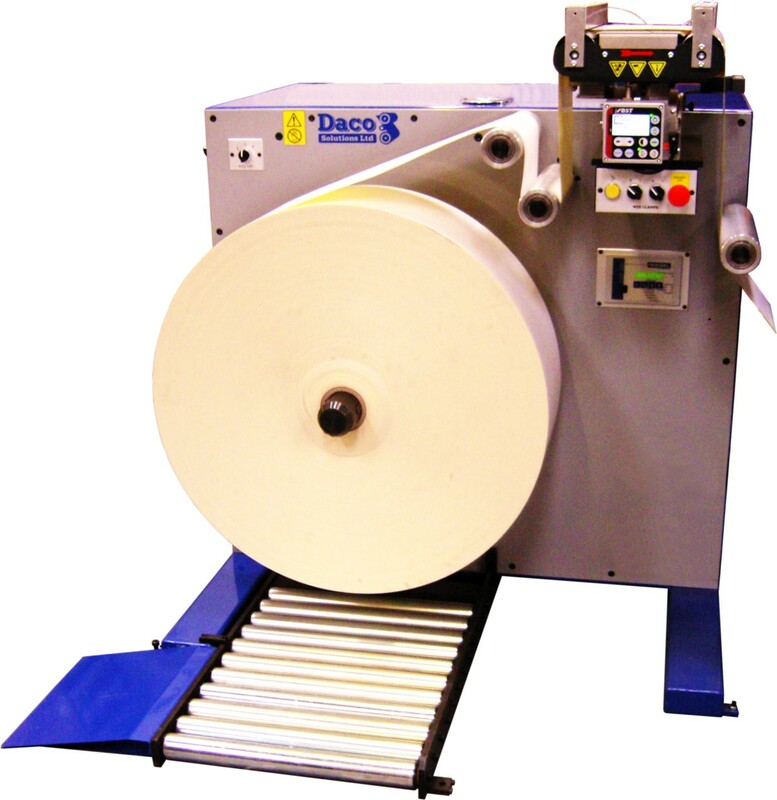 The Daco PLD350M offers all the benefits of turret rewinding but with very quick make ready times unlike conventional rewinding. 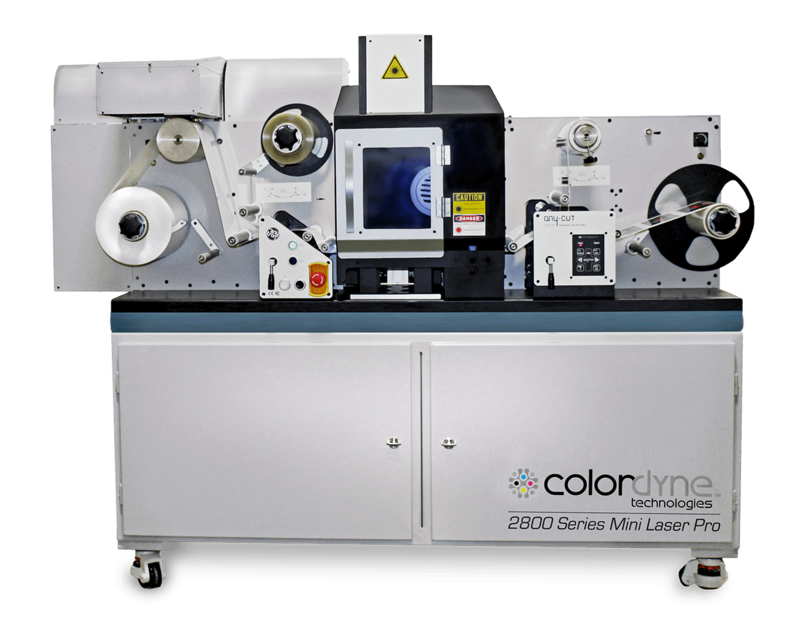 This allows shorter runs to be produced both quickly and more efficiently. 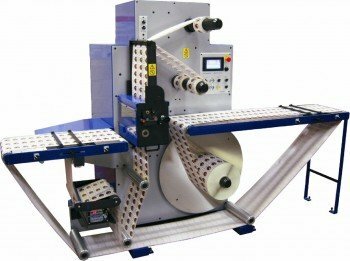 The PLD350M is a very efficient servo driven rotary die cutter with a semi-automatic turret rewinder for very fast and efficient roll production up to a diameter of 340mm (13.38″). 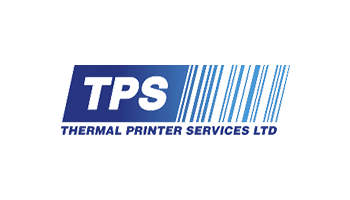 Unlike traditional die cutters, where the machine is stopped for a considerable time whilst operators cut and re-apply the web to the cores, the semi-automatic turret is only stopped for a few seconds whilst the turret indexes. 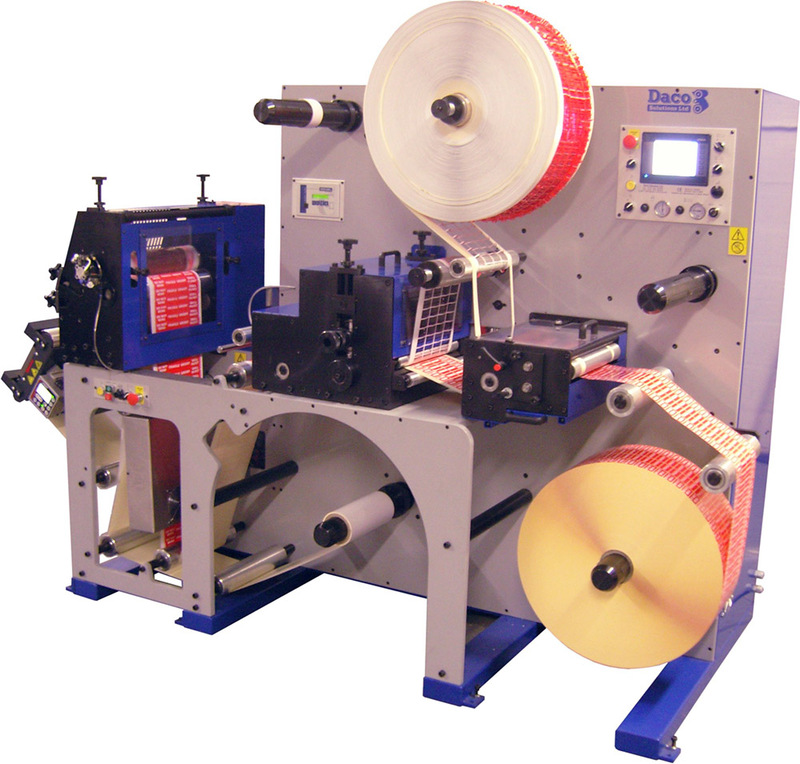 New cores are applied to the rewind shaft whilst the machine is in production; the turret automatically cuts the web, applies the web to the new cores and ejects finished rolls ready for packing. 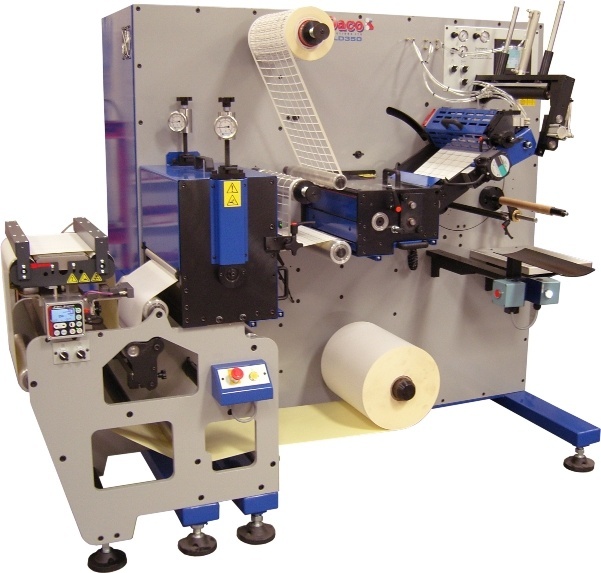 When utilising the rotary die station(s) it is a cost effective solution to blank / plain label converting or with the die removed as a very productive slitter rewinder with a production speed of 175m/minute (492 ft/min). The PLD350M utilises a colour touch screen HMI interface which features job storage for quick and easy setups. The machine remembers all the tension setting, count settings and turret parameters enabling operators to change jobs in minutes. 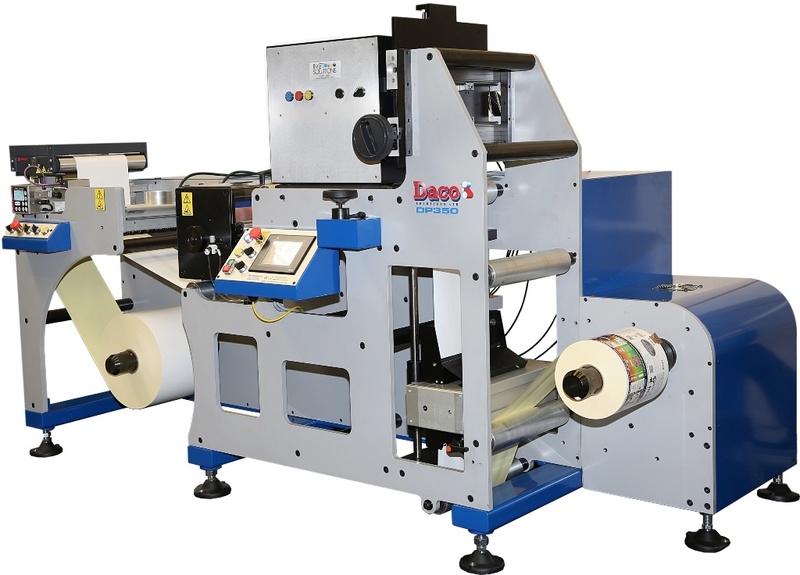 Many clients are finding that the PLD350M is the ideal solution for the production of direct thermal & thermal transfer labels for desktop and industrial printers, retail promotional labels and weigh scale labels. 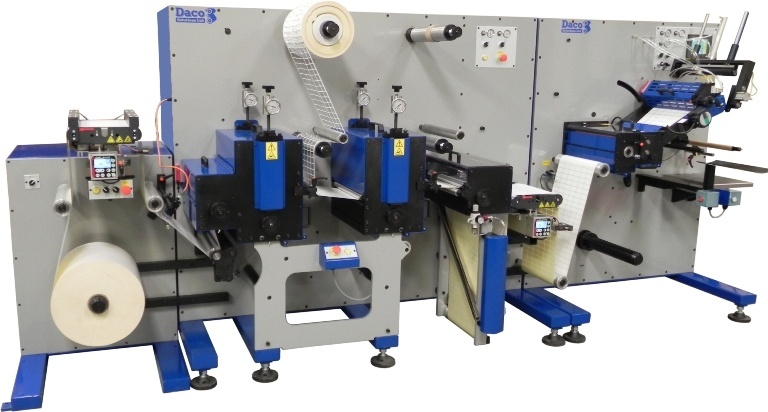 By using the latest in servo drive technology the Daco PLD350M is truly modular and a flexo print unit, digital print module and semi-rotary die cutting can also be added later as production requirements change. Integral splice table with interlocked pneumatic web clamps. Adjustable ultrasonic web guide sensor – enables guiding of opaque & clear materials. 203 – 457 (8″-18″) die repeats. RotoMetrics through hardened anvil – 105T – 13.125″ repeat. 20mm (0.78″) thick precision ground die plates. Gearing – 1/8 cp, 20 degree pressure angle. 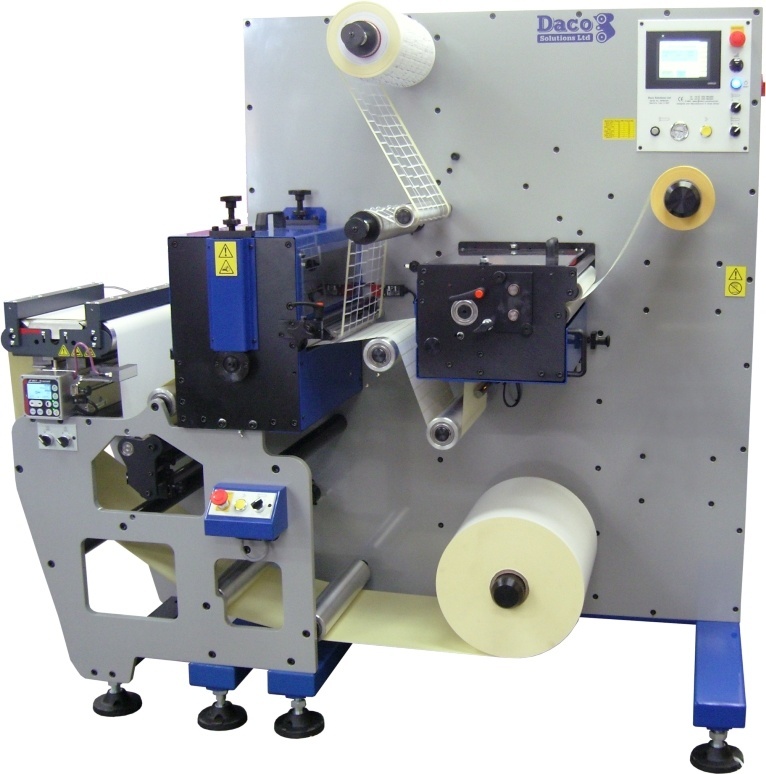 A driven matrix stripping roller with adjustable tension control ensures reliable matrix stripping, enabling high speed running even if the matrix rewind becomes unstable. Matrix / Waste Rewind -700mm (27.5″) diameter. 76mm (3″) mechanical mandrel for waste rewind. Lateral knife adjustment: +/- 8mm (0.31″). Linear – metres / inches. 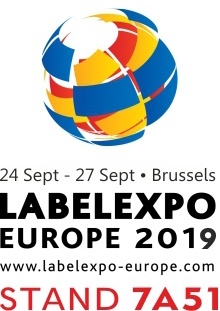 TLC – Total length count until reset by the operator. Automatic calculation of slowdown and stop irrelevant of web speed. RotoMetrics Hydra Jack die pressure gauges.